I've worked with Peppy Parent in the past and I am always amazed at the products that they carry that I have not seen elsewhere. Such as the awesome Puj Snug Spout that I received for review. Elephants don’t come any softer! This ultra-soft spout cover provides the ultimate in protection for children during bath time. The soft material flexes to fit a variety of faucets. It’s also non-absorbent…that means no mildew! Made from recycled materials. 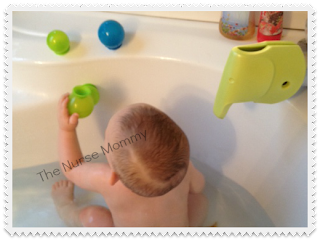 We actually have a Puj bath for my little man that he has recently outgrown, this thing is seriously the best thing since sliced bread, so I knew I would love the Puj Snug Spout. The Puj material is super soft and bendable and it fits any spigot well. My oldest hit his back on this same spigot last year before baby brother was born and is still carrying are scar from it! It was deeply traumatic for both of us, so I knew I had to keep that from happening again. Baby boy loves to reach up and touch it, my oldest loves that he is protected from that kind of injury and mommy loves it as well! It is just an all around great product from and all around awesome company. The Boon Bubbles are a unique, fun addition to bathtime! They float atop the water as play things to grab. Each bubble also has a suction cup that sticks to any smooth surface. Make a bubble train that floats, a bubble chain that sticks to the tub wall, or any other structure your toddler can imagine! Oh the fun we have had with the Boon Bubbles. We stuck them to the oldest boys head like dino horns. Baby boy just loves reaching for them in the tub when I stick them on the side. Word of warning. They stick a little too well and my oldest was left with suction marks on his forehead. Made for an amusing story to tell his first grade teacher though! I keep finding these everywhere. My boys love them so much, they just cannot keep them in the tub. It is amazing how simple things can entertain kids. 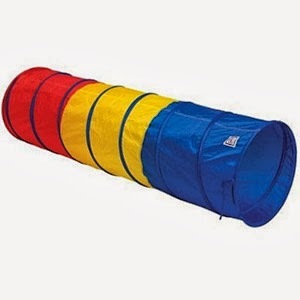 This Pacific Play Tents Find Me tunnel is great fun for toddlers and preschoolers who are eagerly exploring their world! With solid, durable paneling that easily wipes clean, little children can engage their imagination and sense of adventure. We also received the Play Tunnel from Pacific Play Tents. My oldest has a blast in and out of this, especially when the cat joins him in the play. Baby boy is a little hesitant still. We have managed to get him through once or twice but he has his Moms cautious spirit. You can apparently connect this to a play tent, but my oldest enjoys it as is. Mommy loves that it folds up easily and can be stashed behind the couch. Buy It: If you haven't already you should check out Peppy Parent for your Christmas shopping. I almost guarantee that you will find something you have not seen before. You can also check them out on facebook to stay up to date with the latest products! Disclosure: No compensation was received for this post, products mentioned above were received free of charge for review. The Nurse Mommy blog will always provide honest opinions, beliefs or experiences on products reviewed. We will only recommend products or services that we feel are of benefit to our readers. If you have any questions about this review please contact me at nursemommypaige at yahoo dot com.